Tisbe biminiensis is a small tropical copepod naturally found in warm, shallow waters. This particular species was originally isolated from a sandy beach in Brazil in 1998. SA’s Tisbe Pods feed on detritus and microalgae on the substrate and occasionally swim in the water column with a “jerky” swimming motion that attracts attention from finicky fishes. Female copepods release small young (nauplii) that provide a good food source for filter-feeding animals and fish larvae. Tisbe pods reproduce quickly and can tolerate wide ranges in temperature, oxygen, and salinity, making them robust in culture and able to withstand refrigeration for storage. SA’s Tisbe Pods are maintained in clean, single-species cultures. They are fed a high-quality and varied diet of SA’s Phytoplankton and SA Hatchery Diet, ensuring that you are getting the best copepods available! 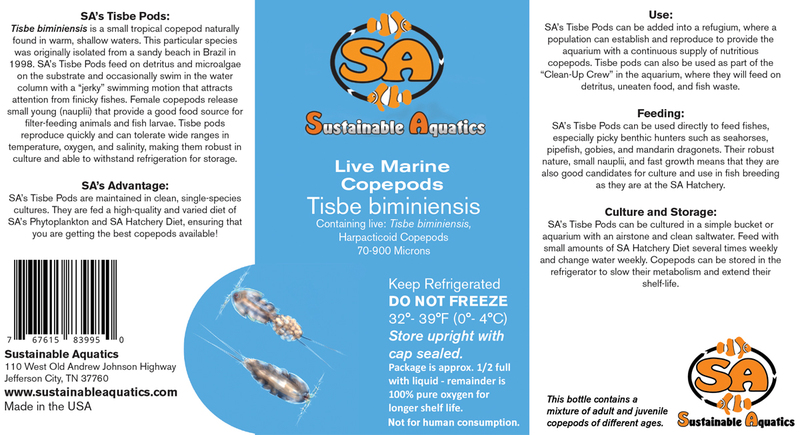 SA’s Tisbe Pods can be added into a refugium, where a population can establish and reproduce to provide the aquarium with a continuous supply of nutritious copepods. Tisbe pods can also be used as part of the “Clean-Up Crew” in the aquarium, where they will feed on detritus, uneaten food, and fish waste. SA’s Tisbe Pods can be used directly to feed fishes, especially picky benthic hunters such as seahorses, pipefish, gobies, and mandarin dragonets. Their robust nature, small nauplii, and fast growth means that they are also good candidates for culture and use in fish breeding as they are at the SA Hatchery. 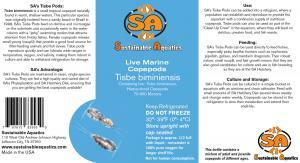 SA’s Tisbe Pods can be cultured in a simple bucket or aquarium with an airstone and clean saltwater. Feed with small amounts of SA Hatchery Diet several times weekly and change water weekly. 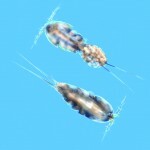 Copepods can be stored in the refrigerator to slow their metabolism and extend their shelf-life.